Appointed to Staff of House Judiciary Committee during Watergate. 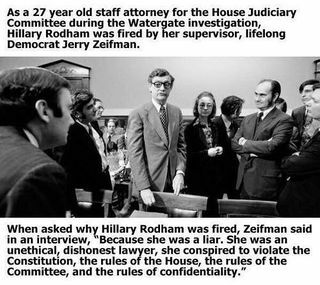 She was "fired" for corrupt and unethical behavior, according to lifelong democrats in charge of the house investigation Dan Calbrese and Jerry Zeifman Ziefman has since been smeared by the Hilary campaign machine (WaPo and Snopes), for the hairsplitting mistake that he technically he could not "fire her" (as she wasn't a direct report to his committee, he could only recommend she be removed). Also they claimed that all her unethical behavior might have been at the suggestion of her bosses (it's always someone else's fault). The pattern of getting in the middle of scandals, being accused of questionable ethics by those closest to her, and "losing evidence" seemed to follow her through her life... along with her defenders making lame excuses for it. According to Zeifman, she was one of a few individuals trying to deny President Nixon legal counsel and hid/removed evidence (legal files and implied they should be lost). And other things like that. Even if Snopes and WaPo's water carrying is true, and she was "just following orders", that doesn't change the ethics/liability... at least not according to the bar or common decency. If your boss orders you to assault someone, and you assault them, then you are guilty of assault. As does her defenses efforts of her and her supporters trying to get people lost in the weeds of technicalities and to ignore the bigger picture/pattern: a small scandal reveals other bigger scandals/questionable behavior, then someone close to her takes the fall, and we move on to the next scandal around her, while she or someone else to blames the "vast right wing conspiracy" for all of it. For the record, that "vast right wing conspiracy", is a quote she plagiarized and took credit for... another pattern. This page was last edited on 14 April 2019, at 21:33.